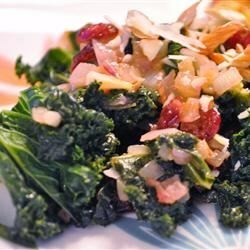 "This quick and tasty recipe combines vitamin-packed kale with both sweet and tangy ingredients for a colorful side dish." Great recipe. I cut the sugar as others suggested, and knew there was NO hope for hubby to like it if I added the cranberries and nuts, so left them out. Turned out GREAT anyway!